The Maya1 jungle, as far as the eye can see, has swallowed up the ancient Maya cities and along with them, their ancient religion. We explored four Maya archaeological sites in two days! Not to mention, swimming with sea turtles, exploring underground lakes and burning up in the oppressive Mexican sun. 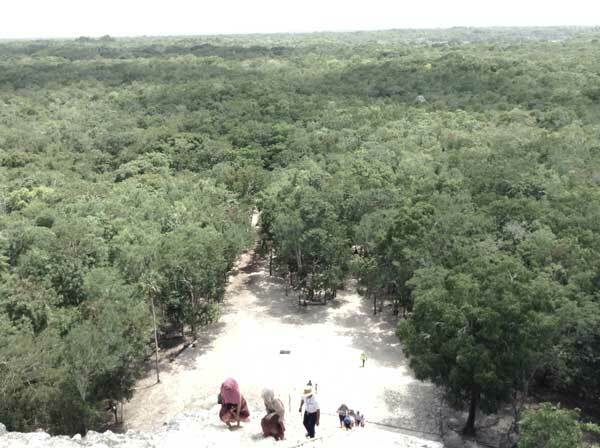 When we got to the top of the highest of the Maya temples that have been cleared of trees, our guide, of Maya descent, could point out the vast 80 km2 territory that was once the enormous Maya stone city of Coba.